The investigation found that less than 1 percent of the 65,000 complaints filed in the state resulted in the officers being charged with a crime. 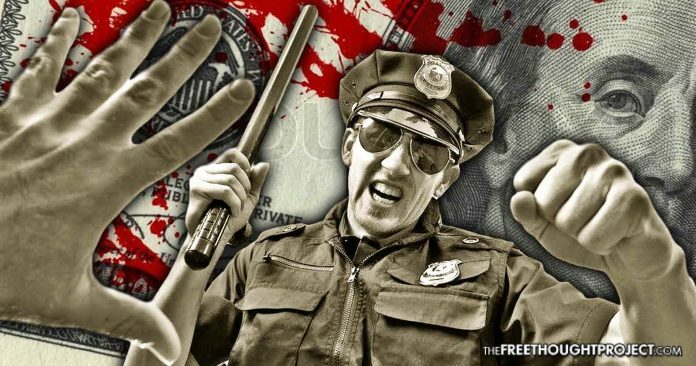 The results have been released in a two-year investigation into police conduct in the state of New Jersey, and it has revealed a system of rampant corruption that has cost taxpayers more than $42 million to cover up the actions of killer cops in the last decade. The money was used to settle lawsuits from more than 200 citizens over things such as wrongful deaths, physical abuses, sexual misconduct and harassment. According to the investigation, which was conducted the Asbury Park Press, not only did the majority of the officers never face charges for their actions—they often kept their jobs and were later promoted. Nearly 65,000 internal affairs complaints have been filed since 2011, and only 226—which is less than 1 percent—resulted in the officers being charged with a crime. The officers who resigned often received compensation, even when it was their deadly or corrupt actions that led to their resignation in the first place. The report claimed that taxpayers shelled out more than $700,000 to 68 officers as compensation for their quiet resignations. Three of those officers went on to become “gypsy cops,” a phenomenon documented by The Free Thought Project that occurs when officers commit heinous offenses, and then simply transfer to a new department. One of the officers highlighted in the investigation was MD Kahn. He was involved in a police chase on June 4, 2017, when the car officers were pursuing crashed into another car, causing it to catch on fire. Miguel Feliz, an innocent father who was in the wrong place at the wrong time, caught on fire along with his car after he was the victim in the crash. The investigation noted that Khan’s actions on that day could have been avoided if he had actually faced consequences for the incident that landed him in jail in February 2016. Khan was arrested for threatening to shoot his brother-in-law and punching him in the face so hard that he caused “serious facial injuries and a possible fractured” eye socket and jaw. Khan has now been charged with 13 counts, including attempted murder, aggravated assault, official misconduct and possession of a weapon for an unlawful purpose. Feliz has filed a lawsuit for $25 million for excessive force after the incident left his body permanently damaged. In 2014, a study found that police officers in New Jersey were more likely to file lawsuits against police departments than the average citizen, and the lawsuits filed by officers were noticeably more expensive for taxpayers.